More companies are keen on keeping older employees at work, especially given the tight labour market here. 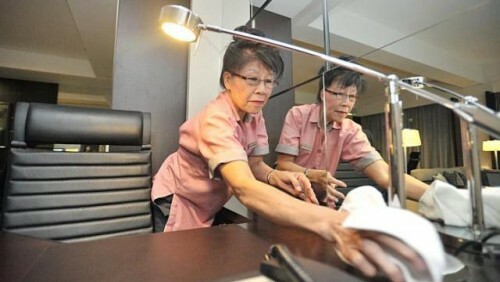 Employers told The Straits Times they would support a move to allow workers to work to an older age, and are willing to restructure jobs to suit older employees. At his May Day rally, Prime Minister Lee Hsien Loong hinted at plans to amend the Retirement and Re-employment Act and extend the re-employment age. Singapore's statutory minimum retirement age is 62, but employers must offer healthy workers who have performed satisfactorily re-employment up to 65, or give them a one-off payment. A general shortage of labour has made firms more willing to tailor jobs to suit older workers. Mr Albert Loh, chief executive of PTS Technologies, which makes radio frequency identification tags, said it does not have workers aged above 60, but is open to hiring them. "It's hard to get workers these days... older workers can still contribute effectively," said Mr Loh. "Most older workers would probably be more suitable in supervisory-level positions where they can give instructions or troubleshoot. They might not be as suitable for operative-type jobs which involve manual labour." Mr Philip Leow, managing director of Fong Shen Mould and Precision Engineering, said automation can help speed up manufacturing processes and reduce the need for manual labour. Among the company's 67 employees, five are in their 60s. "All companies need is to undertake job redesign in order to create jobs that are more suitable for older workers," said Mr Leow. "One of my staff is 65 years old, but he is in a management position as an operations director. He doesn't need to move extremely fast or have nimble fingers to do that job," he added. Indeed, hiring older workers is becoming the norm among smaller firms, said Mr Kurt Wee, president of the Association of Small and Medium Enterprises. "SMEs are very task-oriented... and will accept older workers as long as there's a job fit and good performance," he said. Ms Chan Hoi San, senior vice-president of human resource at StarHub, said that raising the re-employment age would reflect Singapore's socio-economic situation, with citizens living longer. At logistics firm YCH Group, director of human resources Min Lee said it was ready to make special arrangements for older workers, such as having them focus on physically lighter tasks. OCBC Bank's head of human resource planning Jacinta Low, meanwhile, said it does not cut the pay of staff re-hired. Firms need to strike a balance between retaining older workers' skills and knowledge, and planning for younger workers' entry into more senior roles, said consultant Mark Whatley at human resources firm Towers Watson. Still, the retirement age "is but a symbolic milestone", said Mr Victor Tay, chief operating officer of the Singapore Business Federation, and employees' mindsets also have a role to play. Individuals, he said, should view staying in the workforce as a chance to continue serving, to share their experience with younger ones, and to contribute constructively to society. Agreeing, PTS Technologies' Mr Loh - who is himself 62 - said: "I am still on the job as I find it very fulfilling to have something to do. I don't want to retire too soon."